Fitting a screw thread insert is a great way to repair damaged threads and restore the component so the original bolt size can be reused. This type of repair is common in the automotive industry as more and more components are being made from alloy rather than cast iron. This repair can be used on almost any threaded material, cast iron, steel, brass, alloys or plastics. The repair is rather simple to perform but requires special tools and the quality of the repaired thread will be dependent upon the skill of the operator. 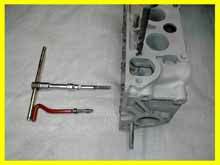 The hardest part is usually the removal of the broken bolt or stud. The best way to remove the broken bolt or stud is progressively drill out the bolt until you reach the point where only the thread is remaining. If care was used during this progressive drilling quite often re-tapping the original thread will be all that is necessary. 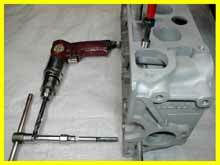 The important first step in successfully removing a broken bolt is the centering of the first drilling. The next important step is to ensure that the progressive holes are drilled parallel to the threaded hole. To assist in correct centering, where possible grind the end of the broken bolt square. Always start with a small drill of at least ¼ the finished size. Where the removal of the broken stud has damaged the thread or the thread is stripped, a thread insert is the answer. These thread inserts are a stainless steel wound thread. They consist of an inner thread where the bolt will locate and an outer thread that will locate the insert coil into the component being repaired. A drill is selected of a size that suits the tapping of the outer thread of the insert. Again the quality of the repair will depend upon the parallel and concentric drilling to the original hole. Either a parallel drilling jig or a small set square can be used to guide the drilling. The depth of the hole is important. 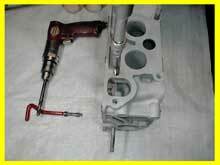 If the component allows the drill to travel completely through the component being repaired, do so. If the thread being repaired is in a blind hole care has to be taken to ensure you drill far enough so that the thread insert won't be tight at the base of the hole. If the blind section of the hole is close to breaking through a drill that is modified flat on the end should be used to finish the hole. At the same time leave enough material at the blind end so as not to hit water or oil. Once a hole of the correct size and depth is achieved the hole can be tapped ready to wind in the thread insert. When tapping threads, continually remove and clean the tap, progressively tapping so a good crisp thread is achieved. Always use a lubricant or tapping aid. Threads could strip and damage if the re-tapping is done in one single process. The insert may have to be trimmed to suit the depth of the hole. This is better done when the insert is unfitted. Always grind the position (opposite end to tang) and snap cleanly where you wish to trim the thread insert. It is important that thread inserts don't protrude from the threaded hole at either end.